Virginia Repertory Theatre is taking a toe-tapping approach to the annual Acts of Faith Festival with its Barksdale season production of Cotton Patch Gospel at Hanover Tavern. 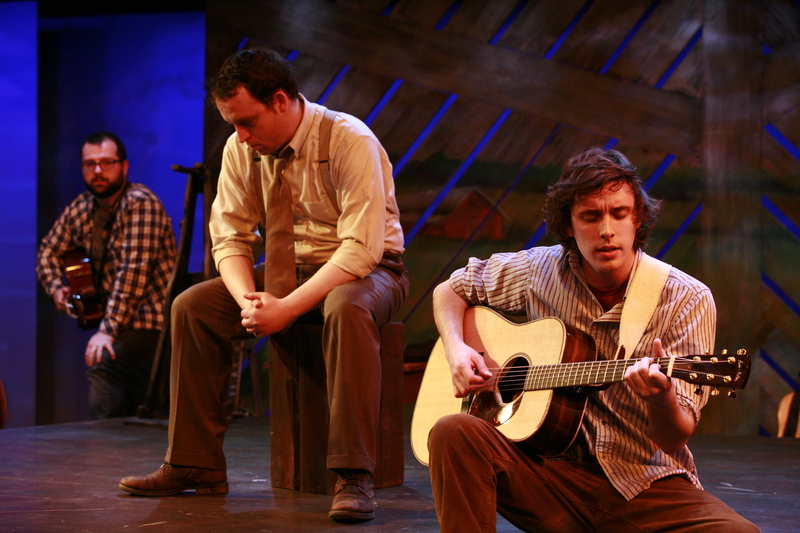 The joyful play is based on “The Cotton Patch Version of Matthew and John,” by Biblical scholar Clarence Jordan, with music and lyrics from Harry Chapin (yes, Cat’s in the Cradle Harry Chapin) who completed the project before his death in 1981. Set in the contemporary South, the play retells the familiar story of Jesus, from his birth to his resurrection. There are a few notable differences in this retelling that give the play its endearing quality. In this story, Jesus is a product of the Bible Belt. He was born in Gainesville, Georgia, instead of Bethlehem and grew up in Valdosta, Georgia — not Nazareth. He delivered his famous Sermon on the Mount from Stone Mountain and he works grits into the conversation, like any good Southerner should, at least once. The play’s contemporary tone gently mixes humor and current references – everything from the National Enquirer to the FBI – into the traditional story from the gospels. 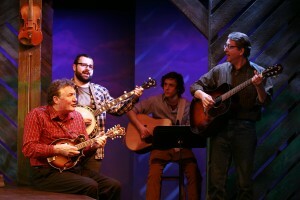 The homespun atmosphere in the theatre is akin to a country hoedown with plenty of bluegrass and country music, making it good family entertainment. Director Chase Kniffen has rounded up a group of talented musicians and actors for his six-person cast including musical director Drew Perkins who aids in the telling of the story with a twinkle in his eye and an appealing twang to his narratives. Lucas Hall and Eric Williams are very engaging in their storytelling and work well with Christopher Stewart who lights up the stage with his various characterizations, which include Matthew, Jesus, and John the Baptist. Stewart morphs into each figure with an ease and finesse that showcases his skills and talents. His passion not only draws you into the story but also delivers a powerful message that’s just right for many families this time of year.